Kenneth Riley is dedicated not only to authenticity, ethnography and history, but also to allegory and spirituality. His work has been called classical, sophisticated, gentle and sensitive. Descended from Irish immigrants on his father’’s side and Dutch farmers on his mother’’s, he was born in Waverly, a small town by the bend of a river in north- central Missouri. Riley was a self-taught drummer, and gained some success touring with Eddie Lain and His Orchestra. But art turned out to be his true career and he pursued it to the Kansas City Art Institute, where he studied drawing with Thomas Hart Benton for a year, developing his skill in interlocking shapes and rhythmic patterns. 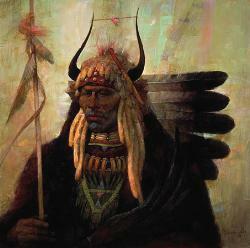 He was also influenced by teacher Harvey Dunn, who studied with Howard Pyle. World War II found Coast Guard Specialist Second Class Kenneth Riley on duty as one of the conflict’’s most honored combat artists. Following the war, Riley found fame as an illustrator, starting with The Saturday Evening Post and later working with Life and National Geographic. After he was chosen to paint Teton and Yellowstone National Parks as part of the Society of Illustrators’’ Artists in the Parks program and was invited to teach at Brigham Young University in Utah, Riley decided to move West to pursue a fine art career. Since then, Riley has shown his work at the Royal Western Watercolor Exhibition, the Tucson Art Museum, the Driscol Collection of American Western Art in Beijing and the Denver Historical Society. His many awards include Silver and Gold Medals, the Stetson Award, the Museum Roundup Award and Best in Show by the Cowboy Artists of America. His paintings can be found in the permanent collections of the White House, the Smithsonian Institution, the Air Force Academy and the West Point Museum. He won the Prix de West, Western art’’s highest honor, in 1995.